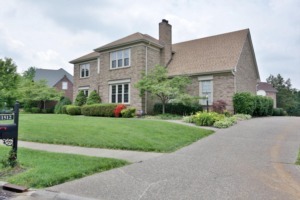 Spacious 4BR, 3.5BA Brick home in Regency Woods. Offers two-story entryway with stained glass flanking the beautiful front door. The formal dining room boasts a trey ceiling, chair rail, and plenty of room for a large dining table. The formal living room is complete with crown molding and a large picture window. The eat-in kicthen is overflowing with storage and counter space. The island is meant for a cook complete with a cook book cubby! You will notice the updated lighting through out the home. The Master includes a spacious ensuite and walk-in closet. Schedule your showing today!